I left my father early that morning, carrying a load of grain, bread, and cheese for my brothers. My stomach fluttered with excitement at the prospect of being among all of those fighting men, armed and ready for battle. 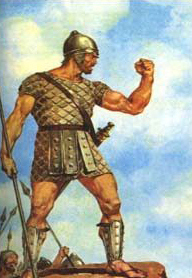 All of my life, I’d dreamed of fighting the Philistines, of being part of our great army blessed by God! I arrived at the camp just in time–just as the soldiers were lining up for battle. Finding the keeper of the supplies, I left my donkey and his burden and hurried to find my brothers in the ranks. I had barely greeted them when I heard the voice. It boomed out over the ranks, echoed off the hillsides. I craned my neck to see him. Anyone with a voice like that had to be big! I was not disappointed. He stood in front of his army, covered with bronze from head to toe and carrying a spear as big as a weaver’s rod. Its iron point alone weighed as much as a young sheep, yet he handled it with ease. “Why are you lining up for battle? Choose a man to come and fight me…if you have any men that is!” His laugh rang out. “If he kills me, we will all be your subjects.” I heard his mocking tone. He shook his head. “Go back to your sheep,” he scorned. “You just came down here to poke your nose in our business and watch a battle!” He spun on his heel and walked away. I turned to the other men, but they all averted their eyes, angry and embarrassed. One man put his hand on my shoulder. “Come with me,” he said. I hurried after him to a tent in the back of the encampment. Guards surrounded it. Strong hands pushed me through the opening. As my eyes adjusted to the dark interior, I heard a man talking in low tones to the one who had brought me. He turned toward me, and I saw that it was the king himself! “You think you can defeat that giant?” he demanded. I swallowed hard, cleared my throat. “I have been tending my father’s sheep most of my life. Sometimes a bear or a lion comes and carries away one of them. I pursue it, fight it with my hands, and kill it to rescue the sheep. If God can save me from a bear or a lion, he will save me from this Philistine!” At that moment, I knew it would be true. I knew God would save me, would save his people. To my surprise, Saul agreed to let me try, even gave me his weapons and armor, but I felt heavy and uncomfortable. I chose to go out to face the giant as myself, not pretending to be a grown warrior. As we walked toward the field where I knew the giant waited, we crossed a stream. I stopped and chose my weapons: five stones. I put them in my pouch, rubbing my fingers across their smooth surfaces. In my other hand I held my sling. The giant and his shield bearer approached as we stepped forward. I saw him stop, and a look of derision crossed his face. He threw back his great, bronze-covered head and laughed. His face turned dark, and he rushed toward me. I ran toward him as well, pulling a stone from my pouch. As I had done hundreds of times, practicing in the fields with the sheep and even protecting them from bears and lions, I placed the stone in the sling. With one fluid motion, I swung it, released the stone, and watched as it sailed through the air and sank into the giant’s forehead. He toppled forward, falling face down onto the ground. His shield bearer dropped his shield and ran. I hurried forward. Without a moment’s hesitation, I grabbed Goliath’s own sword, pulled it from its scabbard, and cut off his head with it! Now grab the sword and off with the head! My fellow Israelites flooded around me, yelling at the victory, and chased the fleeing Philistines. That day the dead Philistines were strewn all along the road to Gath and Ekron. The king’s man found me again in the crowd and brought me to Saul’s tent once more. “Whose son are you, young man?” he asked me. “I am the son of your servant, Jesse of Bethlehem,” I answered. I saw a man approach from behind the king, carrying something heavy and bulky. Saul turned to him, motioning him to come closer. I wrote that for the class I’m taking, and I had so much fun imagining the scene, wondering about what David must have thought. I can still close my eyes and see that dusty field, a hill on each end, with fighting men assembled and a loud and scary voice paralyzing the army with fear. I have always liked to write. As long as I can remember, I’ve been intrigued with words and stories and how people put words together in specific ways that make their stories come to life. Even as a child, before I could read, I made picture books with scrap paper my grandpa brought home from work, binding them together with bright red yarn. Words make sense to me. I love telling stories, either in written form or aloud, and I work hard every day in the office to shut my mouth so I won’t drive my coworkers insane with the funny things I think of to tell them (If you work with me, just allow the rest of the world to think I am successful at this endeavor, ok?!). Today I listened to a speaker talk about how we need to find our core identity and let God work in that, using us in the way that he’s made us to be used. He said a lot of great stuff that I hope I remember, but one of the things that stuck in my mind dealt with how people resist changing. They resist stepping into the unpredictable to become awesome and instead stay with what is predictable, where they are just ok. They like the security of the predictable, even when they have a nagging feeling that it’s not really what they were created for, not where God can use them in great ways. I think that’s a little like David and Goliath. David had a choice that day on the battlefield. He was young, untrained. Absolutely nobody expected anything from him. They definitely did not expect him to step forward and fight the giant that had seasoned warriors shaking in their sandals! He had the choice to stand in the safe predictable-ness of the crowd and be just ok or to step forward into the unpredictable awesomeness that God had planned for him. One little stone stood between him and God’s will, and he chose to step out. What is your Goliath today? What’s blocking the road to what God has in store for you? I ask only because I’m willing to share my own roadblocks. 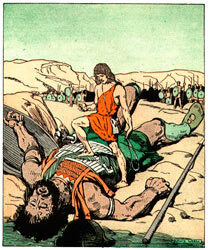 My Goliath comes in fear of letting go and forgiving people who have hurt me in the past. My Goliath comes in fear that I won’t be good enough, that my writing, which I think may be part of what God wants to use in some way, will stink, that people will read it and think, “Whoa! Better stick with your day job, honey!” My Goliath comes in fear of not measuring up, of stepping out on faith and trying to forgive or trying to love more or trying something that leaves me vulnerable and then falling flat on my face and making a mess of it all. 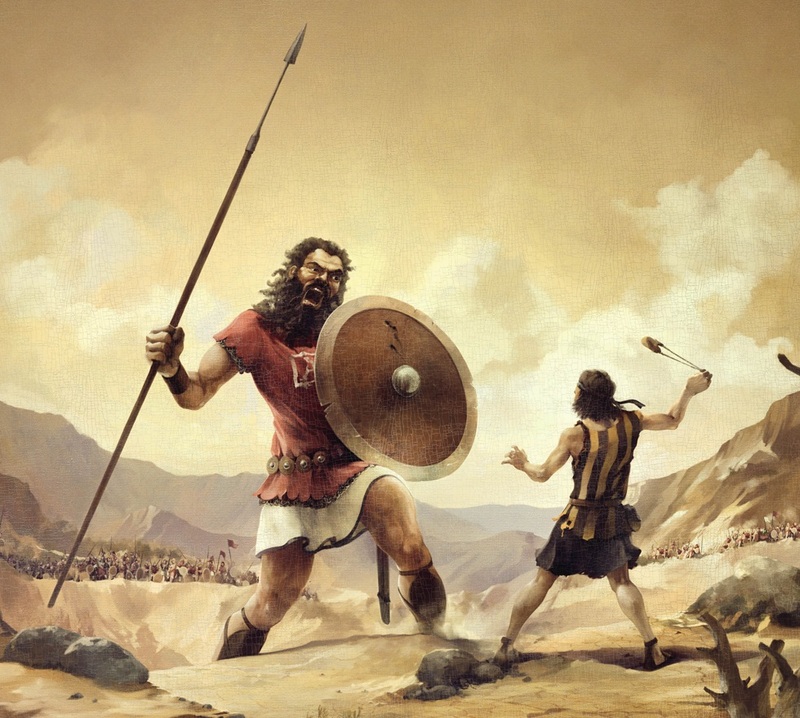 What Goliath is standing on your battlefield today? Are you ready to reach down and pick up that smooth stone God put just within your reach? 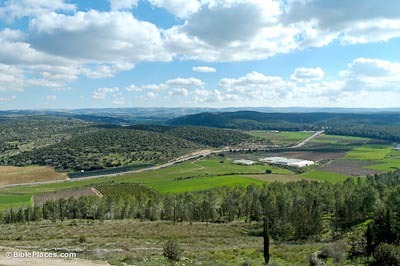 The Elah Valley, where the story took place. lauramckillipwood on Context or Heresy?